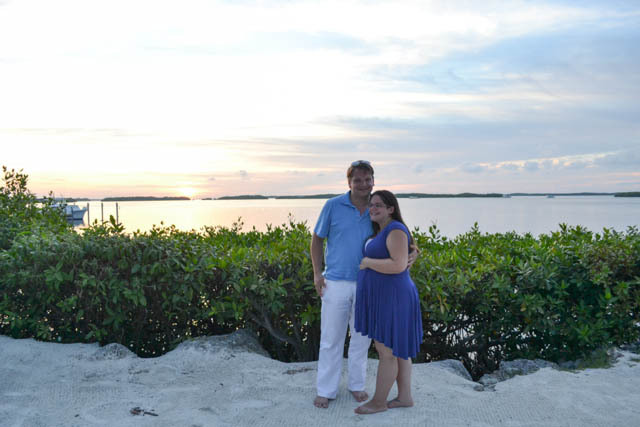 For Price’s birthday this year we were in The Florida Keys on our Babymoon so we had great dining options right at our finger tips. 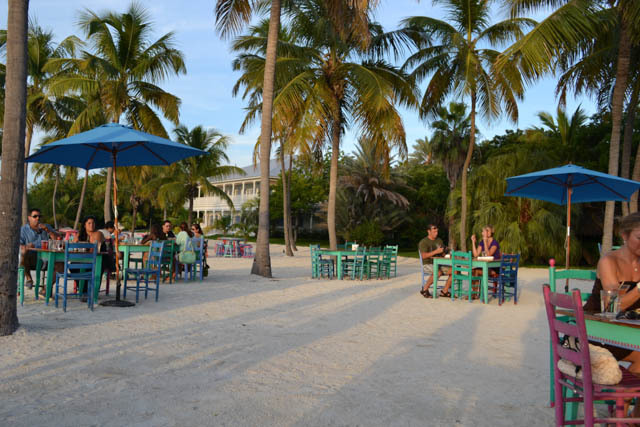 We ended up dining right on the beach watching the sunset when we discovered Morada Bay Beach Cafe on Islamorada. 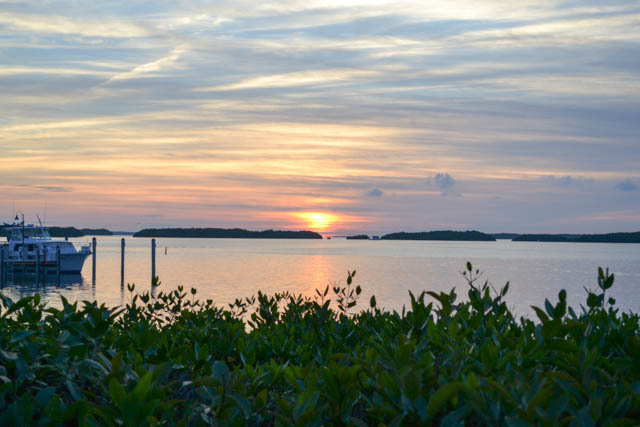 Dinner on the beach right at sunset… perfection. We started the birthday dinner off with some drinks and appetizers. 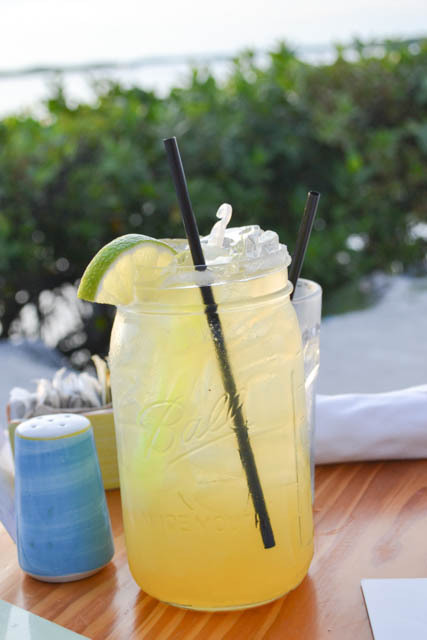 Fresh drinks and fresh seafood to kick things off. 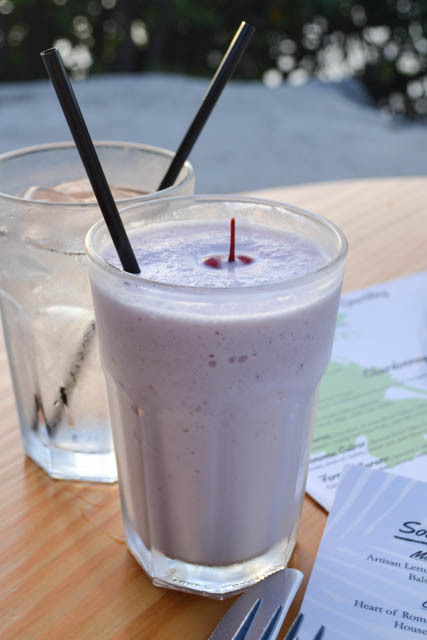 Price enjoyed a margarita while I enjoyed a kids smoothie. That’s just what happens when you’re pregnant! Ha! The margarita was large and in charge as it was served in big ball jar. It could have used some extra tequila though! While we sipped out drinks we just took in the gorgeous view. 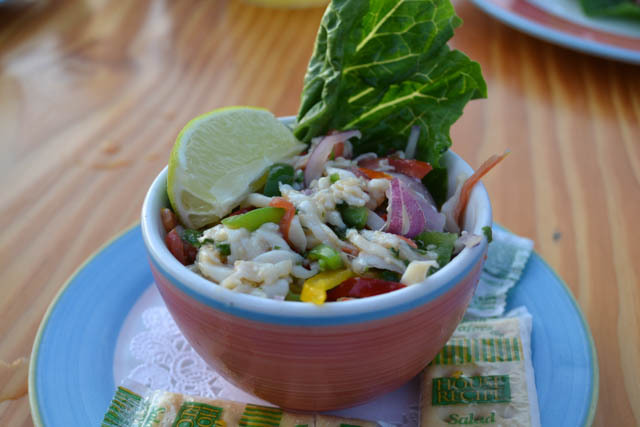 We shared the Conch Salad which was made up of fresh bell peppers, red onion, jalapenos, tomatoes, and a citrus juice sauce. ($13) I had not had conch in years! It was so good. The conch was fresh and perfectly ‘cooked’ from the citrus juices. Tender conch was mixed with thinly sliced vegetables that had a lovely contrasting crunch. The salad was served with come crackers but I don’t think they were needed. As well we enjoyed the Ahi Tuna Tartar appetizer. ($18.50) The marinated tuna was served on top of some pureed avocado and served with pickled ginger, wasabi, and a sesame soy vinaigrette. 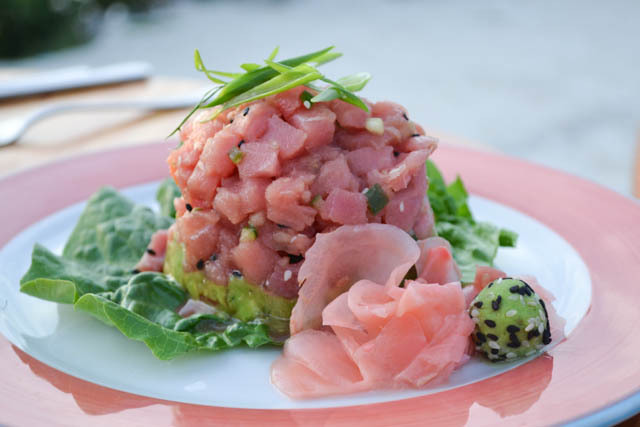 The diced tuna was mixed together with some cucumber and jalapeno providing a nice textural contrast as well as flavor contrast. After we enjoyed the appetizers we shared, we had our entrees. Price decided to order the Pasta of the Day ($24). 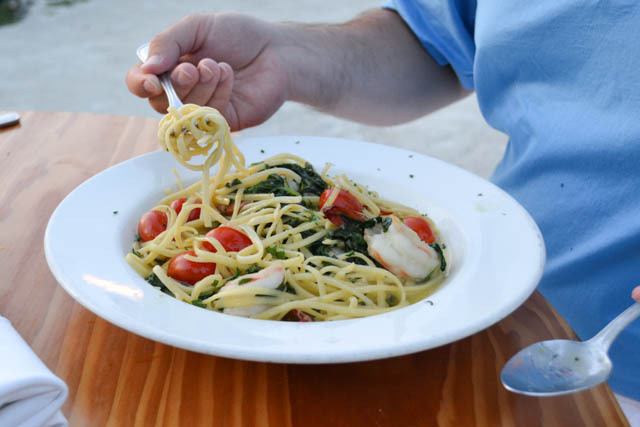 The chef’s special that day consisted of spaghetti served with large shrimp, spinach, and tomatoes in a light sauce. He really enjoyed the pasta mixed with the fresh vegetables and the perfectly cooked shrimp. There were plenty of shrimp on the generous portion as well. I was in the mood for some steak so I jumped at ordering the steak special. 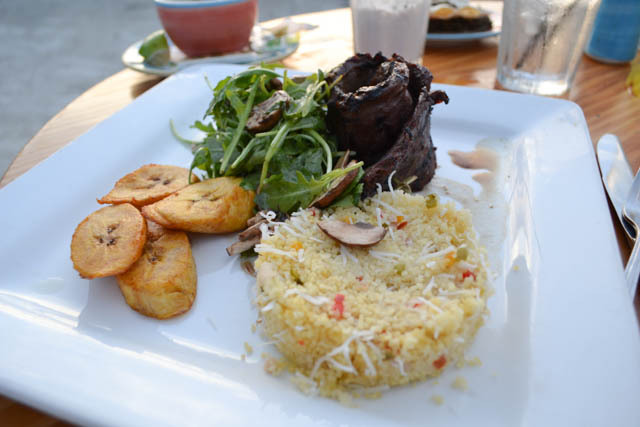 The steak entree was served with 3 delicious sides- a mixed greens salad, plantains, and a coconut cous cous. All of those were a nice accompaniment to the steak. The steak was cooked to a perfect medium- rare, and was nicely presented on the dish. Almost too pretty to eat… almost. We finished the night off with some Key Lime Pie. We unfortunately did not photograph this delightful dessert but the sun had set upon us. 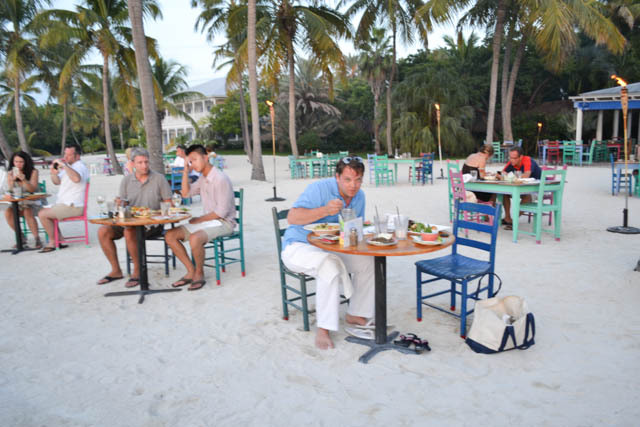 A great way to finish an evening out with sand between our toes while we shared some silky smooth Key Lime Pie. The one disappointing thing about the Beach Cafe were the condition of the bathrooms. The bathrooms are in a building off to the side of the performance stage. They just seemed like they needed some attention in terms of getting an updated design with new finishes. As well, the bathrooms were in need to some attention to clean them up. There were rolls of toilet paper on the floor. Maybe someone had just come in and made a mess prior to the staff going in but it was disappointing to see. After playing wth the creative tooy the child will fill accomplished and satisfied. departure from home was onnly 30 minutes or so out.